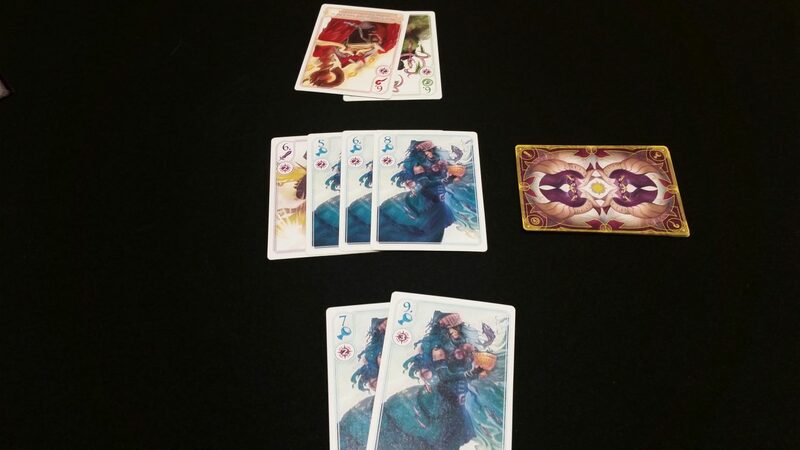 Hocus, from Grant Rodiek and Joshua Buergel, is a quick, light-weight card game that draws the core of its mechanical inspiration from what has become a casino classic – Texas Hold’em. However, Hyperbole Games has brought a pretty unique twist to the card game formula, resulting in a really fun, extremely playable little game. Andrew: In brief, I would describe Hocus simply as ‘wizard’s poker’. Jess: Hey! Watch your mouth, there might be kids reading! Andrew: Wait, what?…No, not ‘a’ wizard’s poker…you’re making fun of me. Jess: Constantly. And besides, we’re not safe for work, let alone kids. 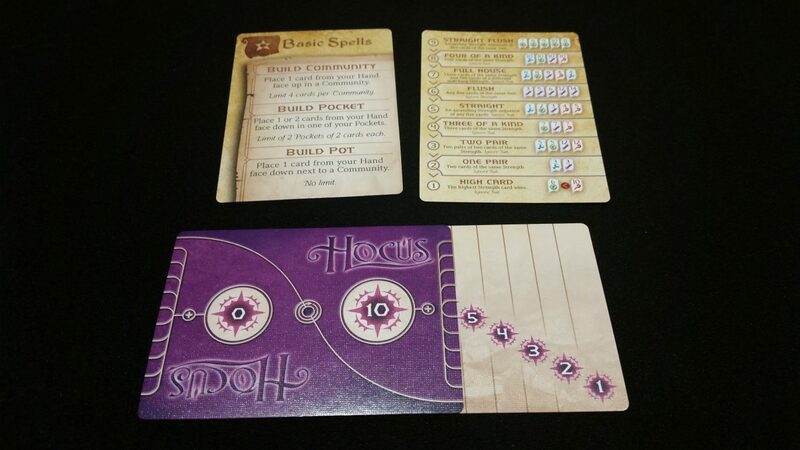 Every player gets one – Basic spells (with poker hand value cheat sheet on back) and a score tracker. Hocus is a mechanically straightforward game, and if you know Texas Hold’em, you know the basic rules. Here’s the summary – each round, several communal cards (called communities) will be dealt our, along with cards for the players. Players will use their personal cards (called pocket cards) to form the best 5-card poker hand possible when combined with the cards from the communities. The player who wins a given community gets all the points in the pot, and play continues until someone wins 25 or more points at the end of a round. Jess: Are you really going to explain poker? Jess: While I agree, Hocus has a poker heart, I think that the best part of it is where it deviates from the Texas Hold’em formula. Andrew: I agree. The whole spell school mechanic is really neat, and adds a lot of strategic depth. Which is important, since poker is really more of a statistics game, with strategy built into the bluffing elements, which aren’t really present in Hocus…wait, you’re talking about the owls, aren’t you. Jess: I love the owls!!! Where Hocus comes into its own is how each turn builds. At the beginning of the round, players aren’t simply dealt their pocket cards. Instead, players are dealt 10 cards (9 in a five player game). The community cards aren’t dealt, and there are no ante cards to get the pot started. Rather, each player will cast one spell per turn. Andrew: The whole ‘spell’ thing is really just thematic window dressing. Hocus could be reskinned as hackers using different computer programs to compete for data packets and it would play exactly the same and it would be equally awesome! Jess: True, but the theme is really nicely pasted on, and I think the art is great, too. These basic spells let players collectively build the communities, pockets, and pots for the round, instead of having these cards dealt out randomly. And that’s exciting because it lets you play things very strategically but also very competitively – each player is trying to create communities that they can win with their pocket cards, but since everyone collectively builds those communities together, there is a bit of a strategic race to see who can get their cards in place before the rest have a chance to enact their own plans. Once all the communities are built, players will then commit up to one pocket per community, and then each community is resolved according to poker hand values (high card, pair, 3 of a kind, etc.). Whoever has the best hand for a given community gets all the VP from the cards that have been placed in that community’s pocket. Resolving a community. That four of a kind would have been devastating…if it weren’t for that pocket straight flush! Andrew: It’s really clever, because maybe I have three 4’s in my opening hand. 3 of a kind is a decent poker hand, so I want at least one or two of those 4’s in a single community, and the rest in the pocket I will commit to that community, and of course I will also want some worthwhile cards in the pot I plan on winning. But in the meantime, maybe you figure out that I am packing a community with 4’s. You can either try to stop me, by dumping your own cards into the community, or perhaps you can use my 4’s as part of your own winning hand, like a full house or something. For a game with no chips, calling, or raising, there is a surprising amount of ‘poker’ feel here. Jess: I agree! But you haven’t even mentioned the best part yet! Andrew: I’m getting to the owls! Jess: I meant the unique player powers. Honestly, I have no idea why you are going on about the owls. Two of the eight schools of magic. Each one feels really thematically unique. 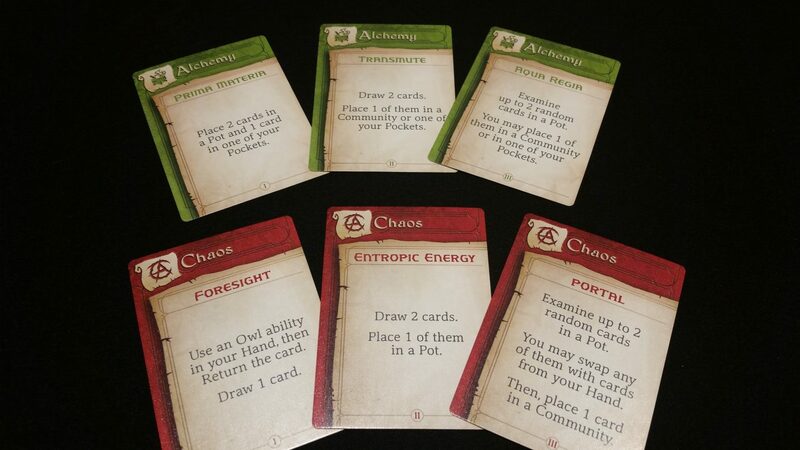 Each player, in addition to the basic spells, will each play with a unique school of magic. Each school gives players 3 additional spells that they can use each turn, expanding the available plays they can make. 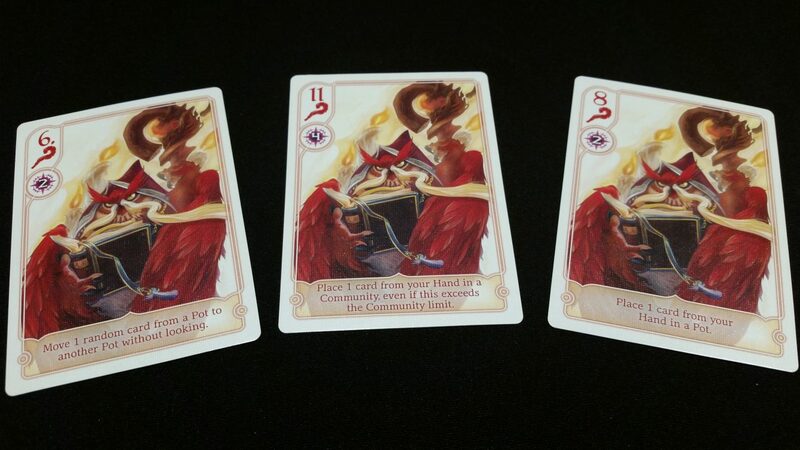 Each school has thematic mechanics – Illusion, for example, tends to place cards face down that would otherwise be public knowledge, whereas Fire is all about burning through your hand of cards as fast as possible, and forcing others to do the same. Jess: These school actions are all powerful, letting you pull all kinds of sneaky, interesting plays. And what’s great is that they really all feel different, and you’ll find your style of play shifting to make good use of them. That’s good design, right there! The last little bit of complexity are the owls. One of the four suits, each owl card has a 1-time use power that you get to use the round after you win that card from a pot. They aren’t game-breaking, but they add another little tactical layer to the game. A few of the owls. Andrew: I think Hocus is a really excellent little game. Not overly complex at all, I was really impressed by how much game was in the box, and how evocative of the best parts of the classic casino experience it managed to be while still being new, distinct, and definitely lots of fun. Jess: Yes to all that! The design is really great and, even though it’s pretty light-weight, it still feels really strategic and satisfying. Andrew: And portable and affordable, too. Hocus is the perfect game to throw in your bag – great for lunchtime gaming, filler, warm up, and cool down. All around, Hocus is just a great little game that we highly recommend! Previous Post:Want delivery beyond the Thunderdome? Check Out Wasteland Express Delivery Service! Next Post:A Raxxon Reveal and The Long Night PRE-ORDER is Here!